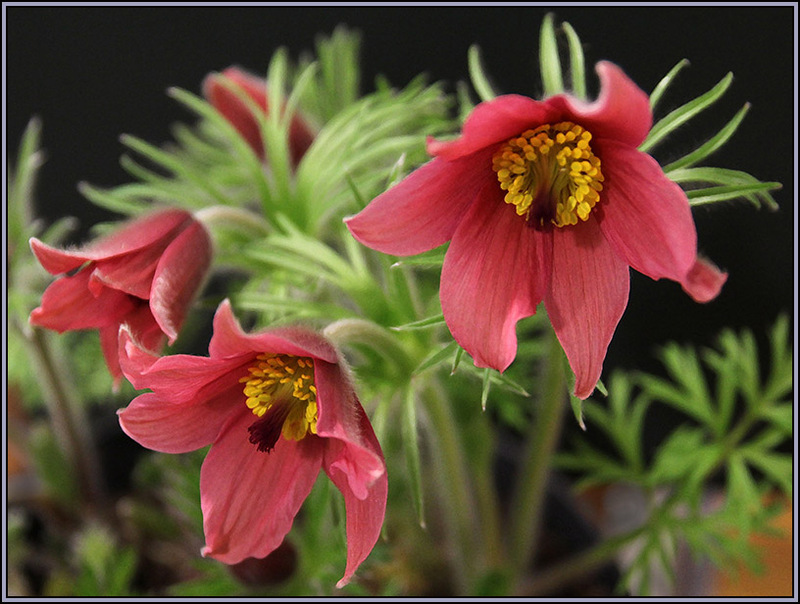 Pulsatilla grandis (P. vulgaris ssp. grandis or P. halleri ssp. grandis) is a native of Hungary and surrounding countries in central Europe, and as far north as Gotland, on limestone areas. The flowers are of a blue to violet colour (the pale blue 'Budapest' is described elsewhere on this website). In truth, the exact status of this species and its relationships to P.vulgaris and P.halleri seem to be complex and Christopher Grey-Wilson devotes a whole page in his monograph to discussing these ! In the spring it timed its flowering just to be ready for the AGS Members' Show, where it was photographed on the bench. P. grandis and its relatives flower before the leaves have fully developed, which is an advantage for showing.